A large high pressure system centered over New Zealand is slow moving. A light to moderate easterly flow on the top of the high may strengthen over the next few days and bring easterly winds if the high continues on it's present course and speed. It looks like the best chance for kitefishing this weekend will be on the west coast at the top of the North Island down to around Kariotahi on Sunday. Saturday winds could be too light to kitefish south of the Kaipara unless you have a lightwind kite. The west coast from North Cape to Dargaville should be fishable both days. Mornings may be best as onshore sea breezes could develop after lunchtime unless some cloud cover arrives over the next couple of days. It looks as though we may get continuing moderate easterlies moving down the North Island early next week, possibly until Wednesday or longer. The South Island may get fishable southwest winds on Sunday up to Birdlings Flats. The bottom of the North Island and top of the South Island looks as though it may be too calm to kitefish but should be great for surfcasting and boat fishing. Kitefishing has certainly picked up on the East Coast. With the westerly change in the weather have come many reports of successful fishing since the beginning of Easter. 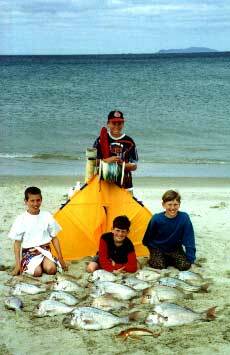 Members from the Kite Fishing Club have been out in force, particularly on the beaches north of Auckland. Te Arai Point seems to be fishing well. Tony Talbot, Eric Easton and Noel from the Kite Fishing Club were fishing there last Sunday and managed a good haul between them. Eric reports salted mullet bait was working well on the day with snapper up to 3kg being taken on it. Noel successfully landed a big hammerhead shark in the gusty conditions, which was a great effort. Another group kite fishing close by the rocks, were also landing some very good fish including a snapper over 5kg. When kitefishing on the east coast always keep a sharp lookout for boats. Last month one club member lost a kite to a small boat which came in very close to the shore to shelter from the strong westerly winds. Robbie Cullen from the Kite Fishing Club has a advised the red sack weed is back at Uretiti Beach. One kitefisher had his line tangle in so much of the weed it took him 3 hours to retrieve his line and untangle the weed. Fortunately he managed to bring in some good snapper as well, so there is fish out there beyond the weed. Robbie recommends that the northern end of Ruakaka would be the best place to kite fish to avoid the weed. There are also some clear patches by the river mouth near the surf club, but care has to be taken to avoid the reef and cray pots in the area. Another snag has been reported. It is off Orewa Beach and is directly out from the end of Noel Road. I have very few details at this stage and will advise when more details come to hand. The best advice is to avoid this particular area until we hear more. There are no other problems on the rest of Orewa Beach that we are aware of. Eric Easton reports he tried Steve Bailey's rolling weight modification suggested in last weeks newsletter. He said he used a 100mm section of downpipe and it worked like a charm at Te Arai Point on his Bottom Longline Rig. At the kite club AGM David Billings won the clubs snapper trophy for the heaviest snapper caught for the year on a kite rig. 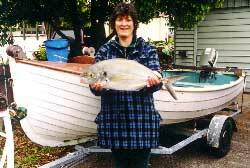 The 10.5kg fish was taken at Glinks Gully in August last year. Well done David, a good fish. Fishing on the Manukau is still good. The water is a lot cooler now and the smaller snapper seem to have moved out of the harbor. The mullet have all but disappeared. The great news is the big trevally are still about. The fishing is better when the tide is running. Last weekend the tides were fairly small so there was little current flow. When conditions are like this you really have to work your baits and keep them moving just to get a bite. Keep the drag fairly light as the trevally have very soft mouths and can easily pull off your hook if the drag is up too far. Shellfish baits are best when targeting trevally, the fresher the better. Flounder are still being caught but I do not think it will be long before they are gone from the shallows due to the water temperature. My name is John and my wife is Maureen Pothan, we started off last year managing the Porangahau Beach Motel and have since added on a Bottle Store and a Fishing Tackle Shop. Over the last 15 years we have been batch owners at the beach and have always had a few Kontiki fishers, including ourselves, successfully fishing the beach. This year started off as normal but by Easter the activity rose to at least 20 plus people a day with Kites and a few Kontikis, kitefishing is really becoming popular in the area. Over the last month the fishing has been red hot with a number of 20 lb plus snapper being taken on kites. There are also heaps of snapper up to 15lbs, gurnard everywhere, the odd trevally and some very big kahawai being caught off our beach on Kites and Kontikis. We get very few small snapper in the area. If you are a kitefisher, surfcaster or kontiki fisher and live in the lower half of the North Island and you haven't tried Porangahau Beach you should certainly think about coming over and trying it. Our Beach is approximately 50km off Waipukurau on the East Coast in Central Hawks Bay and is ideal for Kite Fishing as we have offshore westerly winds about 80% of the time. The beach is safe to drive on as long as you keep off the soft sand. As there is 16km of driveable beach there is plenty of room for everyone. The best fishing places at Porangahau Beach are in front of the country club building and at the end of the tree plantation around 6km up the beach. The best approach is to come down at low tide and check out where the holes are and fish the holes on the incoming tide. Kite and kontiki fishers should keep well away from in front of the houses as there is a hidden rock just past the breakers that catches all lines that go past it. Our Motel is on the beach and we can see the whole 16km of beach right up to Blackhead Point from our place so we are really in touch with what is happening on the beach. I will endeavor to send in a report every week from down here but if anyone wants to know what the conditions are like on the day, just give us a ring on 06 8555112. In our Tackle Shop we are Agents for Shimano Maxima Rapala and also will soon be stocking a range of Paul's Fishing Kites and associated gear.